Great Brickhill Sunday's undefeated home record came close to crumbling this weekend, but a mighty innings from Nimesh Chavda rescued it. 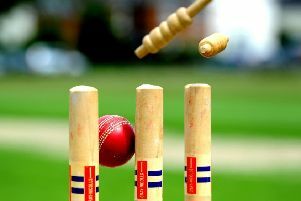 Sitting second in Division 1, they took on Eggington Foresters on Sunday but had to overturn a huge 318 to keep up with early pace-setters Potton. Eggington’s total would have been bigger still but for spirited bowling from the spin pairing of Nimesh Chavda (3-51) and Iqbal John (1-58), though Kieran Burke and Asif Khan (2-42) did well in conditions that made seam bowling a batter’s delight. With Brickhill on just 120 at the mid-way point, the home side’s challenge looked to be well behind the curve before a pair of blistering partnerships between Nimesh Chavda (135) and Jilesh Pattni (76), then between Chavda and Iqbal John (42). When Chavda and John departed with just 18 needed, the home side seemed to be coasting to victory but the fall of three quick wickets had the home fans’ hearts in their mouths before Kieran Burke (12*) and James Aldridge (6*) saw Brickhill home with an over to spare. GBCC Sunday 2nd also registered a win on 10 June. Flitwick 3’s posted 190-5 off 40 with one wicket each from Eddie Woodhouse, John Boyd, Gary Phillips and Dylan Cilliers. In response Brickhill scored 191-7 through Adam Hanley (41), Jarvis Hunt (19), Dylan Cilliers (16) and a really important mid order partnership from Gary Phillips (38) and skipper Julian Blackwell (18). The winning runs came from Richard Hunt with consecutive boundaries.